Go For A Ride Day: Check Out 5 Videos Of Cats Biking Around! Go For A Ride Day falls on November 22nd every year. While the holiday has traditionally been about encouraging humans to get on their bicycles and explore the world, a number of select fearless felines have also proven adept at cruising around. 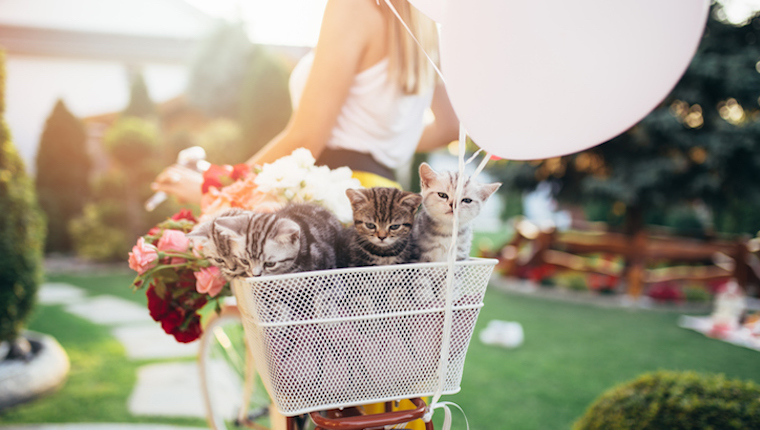 Here’s a round up of five cats you might catch out and about on Go For A Ride Day. Didga is one daredevil feline. She lives down in Australia, where you might find her skateboarding on the streets or even claiming Guinness World Records for pulling off tricks. She also enjoys hopping in a basket on the front of her human’s bicycle and going on adventures to the beach. Do you know about the self-proclaimed Cat Bike Guy? Well, his name is Rudi Saldia and he lives in Philadelphia with his cat, MJ. While riding around the city, MJ likes to perch on Rudi’s neck while taking in the sights. Cezar is a cat with expansive dreams. Namely, this plush and regal looking all-white feline enjoys going on tours across Europe on a bicycle. Smartly, Cezar makes his human do all the pedaling while he lounges back and watches the bucolic scenery fly by. When Miep’s human moved to a new apartment without any outdoor space, she found herself getting restless for some fresh air and new scenery. Hopping on a bike and taking a trip to the local park. It’s a routine that’s now became a weekly occasion for aspiring adventure cat Miep and her trusty human. 5. Take Your Own Cat Out! Has all this cats-on-bicycles action got you wanting to try and saddle up with your own favorite feline? Well, check out this instructional video teaching you the safety steps behind bringing your cat on the road with you. It stars Otani and Yozora, who have been riding around for six years now–and they even once took an epic 24-kilometer bike tour! Do you ever ride your bike with your cat? Are you going to try it out for Go Ride A Bike Day? Let us know in the comments below!